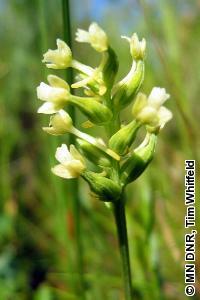 Between 1991 and 2008, more than 50 previously unknown populations of Platanthera clavellata were discovered in Minnesota. These discoveries make it tempting to declare P. clavellata more common than previously thought. While this may be true, the recent discoveries did not happen without a major effort. They were the result of a number of highly directed field searches by experienced field botanists. Even then, success came only after a better understanding of the species' habitat was gained, and techniques for finding that habitat were developed. Unfortunately, all these discoveries were from the core of P. clavellata's range in Minnesota; in fact most were from a relatively small area in central Lake County. No additional populations were found at the periphery of the species' range in southern and central Minnesota, and none of the previously known populations from that area were successfully relocated. Platanthera clavellata was listed as a special concern species in Minnesota in 1984. The stems of P. clavellata are 15-33 cm (5.9-13.0 in.) tall, and arise from slender, fleshy roots. There is 1 principal leaf, which is attached somewhat below the middle of the stem. The leaf is obovate to oblanceolate or oblong in shape, 5-14 cm (2.0-5.5 in.) long, and 1-2.8 cm (0.4-1.1 in.) wide. There are an additional 1-3 vestigial bract-like leaves usually present on the stem above the principal leaf. The inflorescence is a short, terminal raceme, 1.5-4.5 cm (0.6-1.8 in.) long, with 5-20 greenish yellow or greenish white flowers. Each flower is twisted into a more or less horizontal position and subtend by a lanceolate bract that is up to 1.1 cm (0.4 in.) long. The sepals are ovate in shape, and 2-4.5 mm (0.08-0.18 in.) long. The petals are similar to the sepals. The floral lip is oblong in shape, shallowly toothed at the apex, 2.5-5.5 mm (0.10-0.22 in.) long, and 1.5-2.5 mm (0.06-0.10 in.) wide. The spur of the lip is club-shaped, and 9-11 mm (0.35-0.43 in.) long (Smith 1993). The habitat of P. clavellata includes swamp forests that have a continuous or interrupted canopy of Picea mariana (black spruce) or Larix laricina (tamarack). The species also occurs in nonforested poor fens that often ring peatland lakes. These habitats usually have hummocks of Sphagnum spp. (sphagnum moss) interspersed with water-filled hollows. The soils are saturated, well-decomposed peat, and the surface water is acidic with a pH of 4.2-5.5 (Minnesota Department of Natural Resources 2003). Platanthera clavellata is a perennial, insect-pollinated orchid of mossy peatlands. The fleshy root/tuber system tends to be confined to the layer of living moss rather than the actual peat below, and it renews itself each year. This process of annual regeneration does not result in reproduction since only one bud is produced; reproduction is accomplished only by seed. The seeds of P. clavellata are very small and carried on the wind, potentially for great distances. Germination requires the presence of certain mycorrhizal fungi, which are generally habitat specific. The best time to search for P. clavellata is when it is in flower, typically from July 11 to July 30. The primary objectives in managing the habitat of P. clavellata are to maintain the structure and integrity of the biotic community, and to safeguard the delicate hydrology. With these objectives in mind, the impacts of logging must be carefully considered. The loss of canopy trees and the damage to the ground layer caused by heavy equipment (even in winter) would pose significant threats to P. clavellata populations. Alterations to the hydrologic regime may be even more serious, and often more difficult to anticipate. It will be necessary to evaluate the effects of projects on the movement of both ground water and surface water in the general area of known populations. Even activities several miles from a site could disrupt the hydrological processes that are needed to sustain habitat for P. clavellata. Several of the known populations of P. clavellata occur on state and federal land. In most cases, the sites are within timber management zones where they could be subjected to logging operations. Established procedures do allow the presence of P. clavellata to influence land management decisions, although the efficacy of these procedures is not being uniformly monitored. Sheviak, C. J. 2002. Platanthera. Pages 551-571 in Flora of North America Editorial Committee, editors. Flora of North America north of Mexico. Volume 26. Oxford University Press, New York, New York.